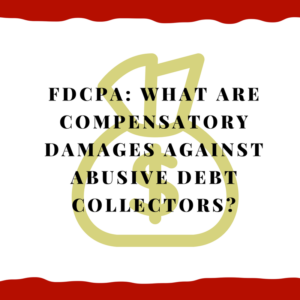 FDCPA: What are compensatory damages against abusive debt collectors? Sometimes it’s called “actual damages,” but it’s the same thing. These are damages that compensate you for your loss. This could be compensation for any type of loss. Let’s say you have a debt collector that’s threatening and harassing you by calling you at all hours, swearing at you, or even using racial slurs. That’s definitely an emotionally damaging experience. You can get mental anguish damages to compensate you for your turmoil. It could be that you experience economic loss. Let’s say you’re at work, and a debt collector calls you at your workplace. You tell them that you can’t get phone calls at work, but they call you anyways and you lose your job. Now you have economic loss because you no longer have that paycheck. You were making X amount of money, then the debt collector made you lose your job so now you’re making Y amount of money. The difference is what can make up the damages that the debt collector can owe you. You could also suffer economic loss from false credit reporting. Typically what happens is that a debt collector will put false a false account on your credit report, which tanks your credit score. Then you’ll apply for a loan, and even though the information is bogus, it costs you more money to get the loan. Typically we talk about mental anguish and economic loss when we’re talking about dealing with abusive debt collectors. The whole idea is that you were at a certain level before the abusive debt collector, and now you’re at a lower level because of them. The gap between those two places is where you can get damages. The jury has to look at the amount of time it took from you, and the severity of your losses to decide the best way to compensate you. You should always look into compensatory damages. Some people focus on statutory damages, including lawyers. They’ll say that you can only get $1,000.00 in statutory damages, but that simply isn’t true. You can also get these actual/compensatory damages, which can be even much more than $1,000 (depending on your case). We have had verdicts and settlements in the six figure range for mental anguish damages against a collector. So when the debt collectors are calling your family, friends, coworkers, preacher, etc., think about what they’re costing you mentally, physically, and financially. Thanks for reading, and we will forward to chatting with you!